Managing a social media agency has its ups and downs. You know how soon the 'new client adrenaline rush' disappears when reality strikes and you realize you have to prove your worth, month after month. 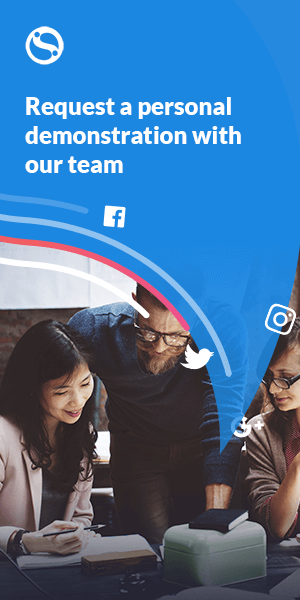 Providing a raft of social media activities is one thing, but how do you actually prove they're beneficial to your client? You’re not alone. According to eMarketer, the toughest challenge for social marketers is measuring ROI. 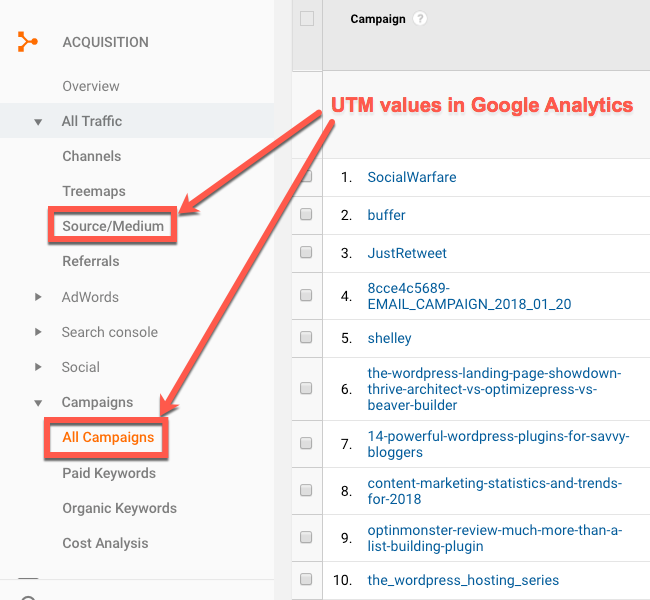 In this article, you'll learn how to track each social media campaign in Google Analytics with UTM values, so you can prove that your clients are getting a return on their investment. The UTM values help to track your web traffic in Google Analytics. If you were to click the example link above then Google Analytics would identify that you arrived at the website page (Writing Techniques) from the Enchanting Marketing email campaign dated 13 March 2015. Without the UTM values, Google Analytics wouldn't know how you arrived, and would add you to the ‘direct traffic’ bucket. Note: UTM stands for Urchin Tracking Module. Why Urchin? Well, that's the name of the software company that invented them, before they were acquired by Google in 2005. Campaign Source (required*) – Used to identify the traffic source; e.g. Twitter, newsletter, etc. Campaign Medium – Used to identify the marketing medium or channel; e.g. social, email, ppc, etc. Campaign Name – Used to identify your campaign; e.g. product launch, special offer, etc. Campaign Term – Used to identify the paid keywords in advertising; e.g. DSLR camera, etc. Campaign Content – Used to differentiate ads or content format; e.g. video, image, etc. Note: *Campaign Source is the only parameter marked as required. But to get any meaningful data, you should use Source, Medium, and Name. Unfortunately, Google is discontinuing its URL shortening service, so you'll have to consider another link shortening service, like Bitly. Note: You don't have to shorten the URL, but with such a long link it's easy for characters to get missed or chopped off when copying and sharing, especially on Twitter. Google Analytics would record utm_source=twitter and utm_source=Twitter as two different sources. Most people recommend using lowercase, but whatever you decide, stick to it. 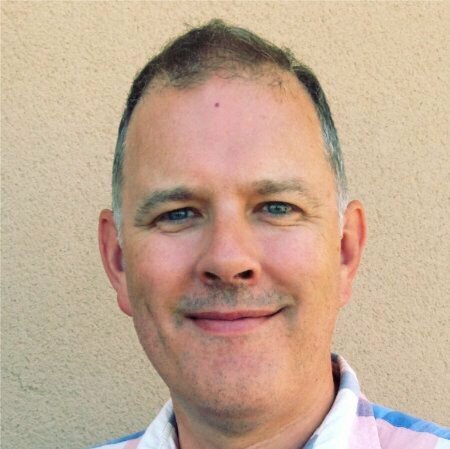 Matt Cutts recommends using dashes rather than underscores as separators in your values. For example, use facebook-post rather than facebook_post. The first is descriptive and long, while the second one is more succinct. As mentioned above, once you've added UTM values to your URL it can become somewhat lengthy. A link shortener helps to keep URLs tidy and manageable. 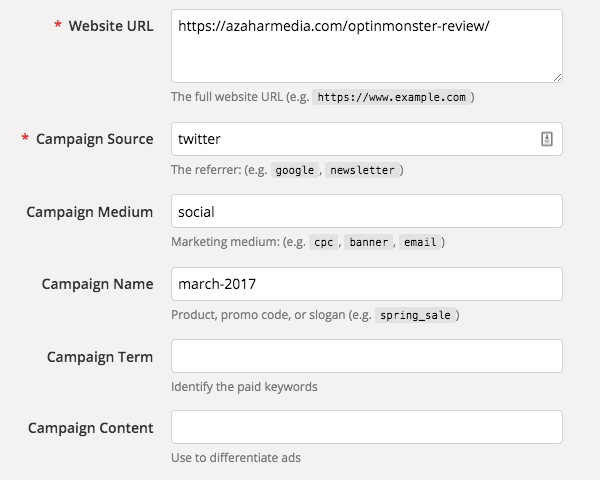 It's good practice to track your UTM values for all your campaigns in one central location. You could use a spreadsheet like this or a UTM tracking tool like Terminus. Make sure you create a guide for your team, so they know how to populate the fields. Source - Where is the traffic coming from? Medium - How is the traffic coming to my website? Campaign - Why is the traffic coming to my website? Google recommends using the Source field to describe the 'referrer' or the platform that's sending the traffic. Don't be tempted to think of the referrer as the person sharing the link, because that will change, depending on who has posted the content. Where's the traffic coming from? It's coming from Twitter, Facebook or Instagram. How is the traffic coming to my website? It's coming via social media. However, I prefer to use the term 'social', and use other fields to differentiate further. (See below). Why is the traffic coming to my website? It's coming via our new Smart Posts campaign. Using the primary dimensions you can answer the questions above - where, how, and why - about your traffic. But how do you prove your ROI? 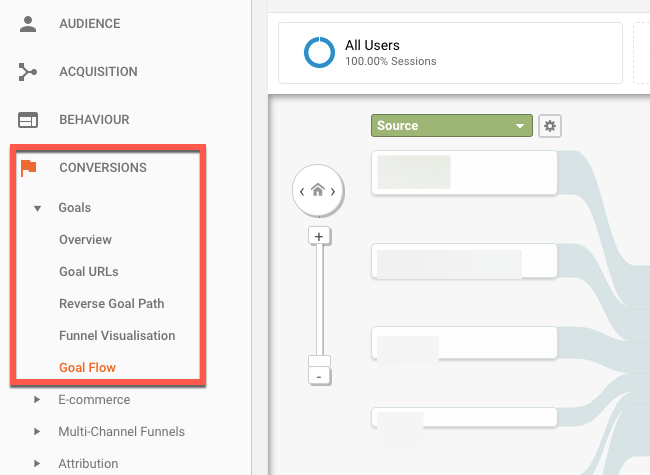 The best way to prove your ROI in Google Analytics is to use Goals and Conversions. You can create goals to track different outcomes such as newsletter subscribers, contact form submissions, new leads, and customers. Step 1: Click 'Admin' at the bottom of the left-hand sidebar menu. Step 2: Under 'View' click 'Goals'. Step 3: Click the 'New Goal' button. Step 4: Select the 'Custom' option, rather than a preconfigured template, and click the 'Continue' button. Step 5: Under 'Goal description', enter the name of your goal; e.g. 'Contact Lead'. Step 6: Select 'Destination' as the type of goal and click on 'Continue'. 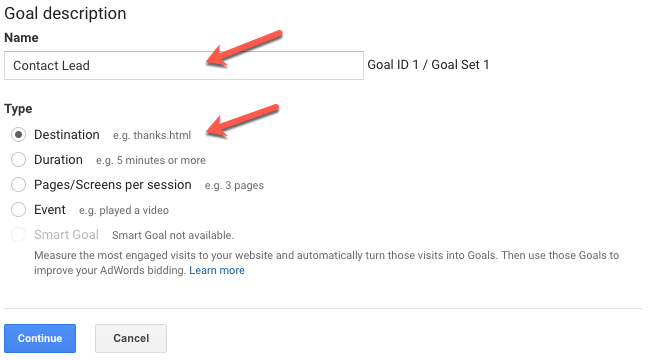 Step 7: Under 'Goal details', set the 'Destination' equal to your Contact Thank You page URL, e.g. '/contact-thank-you/'. 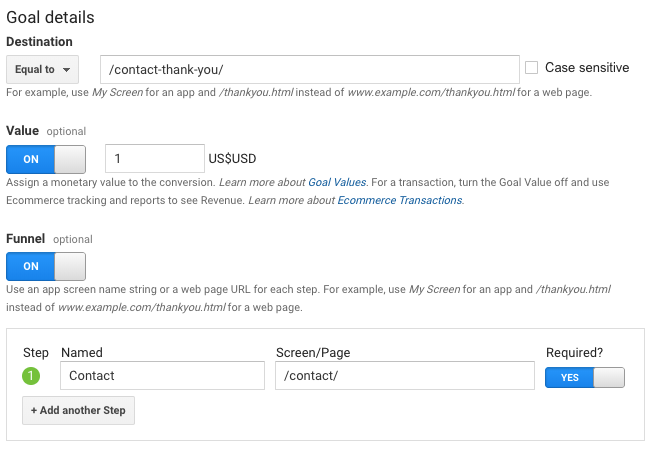 Step 8: Set 'Value' to 'On' and assign a monetary value to your goal. Setting a $1 value for each goal is fine. Step 9: Set 'Funnel' to 'On' and enter the URL of your Contact form, e.g. '/contact', then set 'Required' to 'Yes'. Step 10: Click on 'Save', to create your first Goal. Goals - What is the ROI of my social media campaigns? Another way to track your UTM values and ROI in Google Analytics is to create a Dashboard. This gives you a quick, visual format of the data you want rather than trawling through different menus. Each Dashboard is made up of Widgets. For example, you could create a Social Traffic Campaigns and Conversions Widget to display your top campaigns ordered by most sessions with the number of goal completions from each campaign. Step 1: Click on the 'Dashboards' tab in the left sidebar under 'Customisation'. Then click the red 'Create' button. Step 2: Select the 'Blank Canvas' option and name your dashboard 'Social Media'. Step 3: In the 'Add a Widget' box, under 'Standard' select the Table option. Step 5: Select the option to 'Show a table with 10 rows'. 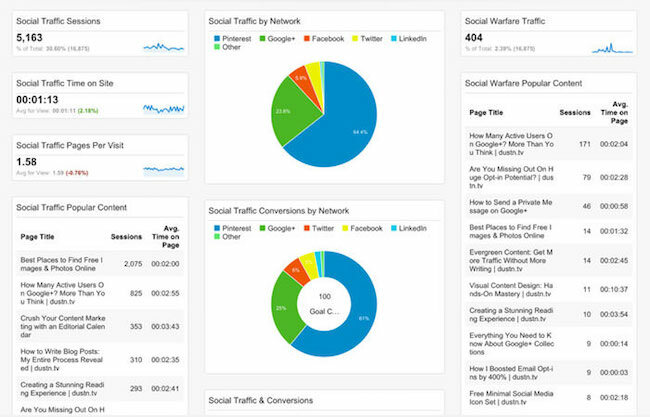 Using a dashboard with your chosen widget reports gives you a quick way to access your data and makes it easy to report on your social media campaigns. When you start tracking your social media campaigns with UTM values along with Goals and Conversions, you'll be able to prove your worth to your clients. The key is to make sure you and your team are consistent so that your data is accurate.